Risk Roundup – Emily Holbrook hosts Cavalcade of Risk #171 at Risk Management Monitor – be sure to check it out. One to watch: Wal-Mart Class action & WC – In Business Insurance, Roberto Ceniceros writes about a Wal-Mart class action settlement that raises big workers comp questions. Josephine Gianzero et al. v. Wal-Mart Stores Inc. resulted in a settlement for 13,521 plaintiffs. It raises several issues of concern related to workers comp: the case was a breach of the exclusive remedy provision – an issue that is always of some concern to employers – and it raises questions about medical claims management. (Here’s a summary of the case when the class action was certified in 2010. “Not surprisingly, the study found that workers are more likely to seek attorneys when they feel threatened. Sources of perceived threats can take different forms. The character of the employment relationship, for example, was a factor for the 23% who strongly agreed that they hired attorneys because they feared being fired or laid off. Fifteen percent also strongly agreed that they needed attorneys because their employer could perceive their claims as illegitimate. It is the first time in their probe of the Upper Big Branch Mine Disaster that prosecutors have filed charges alleging Massey officials engaged in a scheme that went beyond the Raleigh County mine where 29 workers died in an April 2010 explosion. Follow the ongoing story and find links to other coverage at Ward’s Coal Tattoo blog. Pharma Costs – Joe Paduda links to and comments on a recent Express Scripts drug trends report. The long and short of it? Pharmacy price increases are driven by brands. Fighting Fraud – Southern California has 65 billboards warning about work comp fraud. To raise public awareness or criminal penalties associated with fraud, the boards will be placed on billboards and transit shelter posters placed across San Diego County. Strange Risks – Can you insure against acne attacks or hair loss? Lori Widmer has an entertaining read in this month’s Risk Management Magazine: The Stranger Side of Risk. Solvents & thinners – low risk chemicals or killers? How much does it cost companies to lose employees? While many of us were planning for Black Friday shopping sprees over Thanksgiving weekend, more than 100 Bangladesh garment workers died in a Tazreen Fashions factory fire because there were insufficient exits for workers to escape. Tragic as the story is, it is not unique. Since 2006, more than 500 Bangladeshi workers have died in factory fires. The Bangladesh factory fires are what working life looked like in the U.S. pre-fire codes, pre-fair labor standards, pre-OSHA. Workers went to work unsure if they would return home safely each day. The Bangladesh fire calls to mind the infamous 1911 Triangle Shirtwaist Fire in New York, a tragic story that resulted in a huge public outcry for change. The fire gave impetus and momentum to workers compensation legislation, child labor laws, fair labor standards, building code and fire regulations, and more. Even with our worker protections, it takes vigilance to prevent tragedy from repeating itself in the workplace next door. In 1991, a fire in an Imperial Foods poultry processing plant in North Carolina claimed the lives of 25 workers who had been locked in to prevent theft. In 2003, a New York Times investigation revealed that retail giant Wal-mart was locking night shift workers in. In addition to the “locked in worker” issue, OSHA citations for other exit-related safety violations include many familiar household brand names: Home Goods, CVS, Rite Aid, Kohl’s, Toys R Us, to name but a few. Will the Bangladesh fire be a tipping point? Tazreen Fashions is a subsidiary of the Tuba Group, a major Bangladeshi garment exporter whose clients include Wal-Mart, Carrefour and IKEA, according to its website. Its factories supply garments to the U.S., Germany, France, Italy and the Netherlands, among other countries. The Tazreen factory opened in 2009 and employed about 1,700 people. Photos at the scene of the fire show that clothing was being produced for Wal-Mart. The retail giant has issued statements distancing itself from the factory, saying Tazreen was unauthorized to do work for Wal-Mart, and blaming a supplier for subcontracting work. Complex webs of subcontractors – both domestically and internationally – are an increasingly convenient way for large multinational companies to defect responsibility, but should we accept that Wal-Mart and other mega-buyers can’t better control their supply chain? Surely, American companies could join forces in leveraging their buying power to demand that safety and basic human rights are enforced if they had the will to do so. U.S. consumers and policy makers need to demand more accountability from the organizations that we buy our clothes, our phones, and our electronics from. The following video is distressing and gruesome, but we think it deserves airing. It’s the human toll that’s paid for getting shirts for a few cents less. When a laborer with limited English is disabled from physical work, is he obligated to increase his employability by learning English? This interesting question emerged in the case of Enrique Gutierrez, a 48 year old welder who worked at Merivic, a company specializing in grain-related processing. Gutierrez came to the United States at age 14, but in his 34 years in the country never learned to speak or write English. While at work, Gutierrez fell about 10 feet onto a steel table, injuring his shoulder and wrist. He underwent two surgeries, worked for a while as a one-armed welder, and then was let go. His post-injury functioning was significantly limited, including difficulty lifting and carrying, gripping and grasping, and reaching. upon non-English speaking workers than English speaking workers. because they were willing to work for less wages. injury that would mitigate the effects of such an injury. We simply cannot assume that claimant was capable of such training or that such classes are generally successful in leading to employment where fluent English is required . . . .
By reiterating the logic of the pre-Lovic court, Merivic was attacking settled – albeit recently settled – law. The Appeals Court rejected this “collateral attack” on Lovic and upheld the permanent total award, and in doing stumbled upon yet another conundrum: that of the older worker. The court found that once a laborer goes beyond age 47, his ability to perform physically demanding work comes into question. A vocational expert retained by Gutierrez described the 48 year old worker as “approaching advanced age.” The Judge noted that “We have previously held the age of forty-seven is a factor that the commissioner may consider in finding industrial disability.” The expert also noted that Gutierrez’s entire career involved “limited education” and a work history limited to physically demanding jobs, which his permanent work restrictions now prevented him from performing. Our Colleague Peter Rousmaniere provides a valuable perspective on aging manual workers. In his Risk & Insurance article “The Age Trap” he points out that 55+ workers comprised 16.7 percent of the workforce in 2010, a number projected to increase to 22.7 percent by 2020. In contrast to Enrique Gutierrez, most aging workers are not injured and eligible for workers comp; to be sure, their bodies are wearing down and they are confronted with diminishing strength and balance, even as they desperately try to hold onto their places in the workforce. Rousmaniere suggests that employers develop a renewed focus on prevention, one that has been adapted to the realities of the aging worker. After all, these workers are valued for the skill and experience they bring to the work, even as their work capacities diminish. The Big picture here – and it is a very big picture indeed – is the dilemma of aging workers who perform physically demanding jobs and who have little education and virtually no transferable skills. There are millions of such workers, some are immigrants, while many others are native born. Most have zero prospects for a secure retirement, even as Congress contemplates pushing social security retirement even further into the future. Whether they like their jobs or not, aging workers see themselves working out of necessity well into the their 60s, 70s and even 80s. 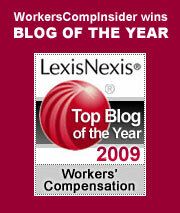 As their bodies inevitably wear out, as their injuries (cumulative and sudden) lead a number of them into workers comp courts across the country, judges will be confronted with the same dilemma that faced the appeals court in Iowa: for older workers with no transferable skills, workers comp becomes the retirement plan of choice for those with no retirement plans and no way to continue working. John Pearson was diagnosed in his mid-20s with diabetes and was insulin dependent. About fifteen years after the diagnosis, he was working for an Arkansas temporary placement agency, Worksource, which sent him to a steel fabricator. His temporary employer gave him a pair of steel toe boots and assigned him the task of covering warm steel bundles with blankets. The job required a lot of rapid walking across a large field, as the bundles emerged from the plant at odd intervals. In the course of the day he experienced discomfort in his left foot and at the end of the day he found a blister on his left great toe. The next day he requested a wider pair of boots, but none were available. The employer suggested he buy them, but he could not afford to do so before being paid – and payday was still a couple weeks away. Two weeks later Pearson was diagnosed with “diabetic neuropathy and cellulitis.” Worksource sent him to another doctor, who diagnosed a diabetic ulcer and cellulitis and placed him on light duty, restricting his standing and walking. (The court is silent on how long Pearson continued to work at the steel fabricator.) Ultimately, surgery was performed on the toe, which fortunately did not require amputation, and Pearson was able to begin working again, albeit with (temporary) restrictions. Pearson took a job in a Waffle House, where he was able to resume full time work. In the meantime, he was faced with lost wages and formidable medical bills. (a) Caused by rapid repetitive motion. The Arkansas Court of Appeals agreed with the commission that the injury did not meet first criteria: there was no specific incident identifiable by time and place. However, the Court found that the injury was caused by “rapid repetitive motion,” applying a two-pronged test that is stunning in its obviousness: did injury involve “repetition” and did it involve “rapidity”? The “repetitive” part involved walking itself: Pearson walked up and down the field in tight boots, watching for the steel bundles as they emerged from the plant. The rapid part involved his walking briskly to protect the bundles as they appeared. He walked from bundle to bundle, as fast as he could, performing the job as instructed. In doing so, the boots rubbed his toe continuously over the course of the day, resulting in a blister. For most people, a blister is no big deal. For a diabetic, it could lead directly to amputation. It is difficult to draw conclusions from this unusual case. Because Pearson was a temporary employee, the steel company had no awareness of his diabetes and no reason to be aware of it: he was able to perform the work as assigned. Theoretically, they could have done better on Pearson’s request for wider boots, but they had no reason to anticipate a serious problem beyond a bit of discomfort. Pearson himself was probably unaware of the risks involved in wearing the tight boots. He obviously was feeling pressure to earn money and probably thought the discomfort, while painful, was not a serious matter. Perhaps the most important aspect of this case is Pearson himself: despite a life-altering health problem, he is strongly motivated to work. In the few months described in the court narrative, he tries hard to do what he’s supposed to do and he keeps working as best he can. Given comfortable footwear, Pearson will do just fine. Marijuana: coming to a state near you – and probably sooner than you think! OK, this is something we never contemplated…straight from the Seattle Police Department’s Blotter, we bring you Marijwhatnow? A Guide to Legal Marijuana Use In Seattle. These voter approvals for recreational use mark a new twist – prior legislative approvals have dealt with medical use of the drug. Last week’s election saw other marijuana ballot initiatives in this vein – medical marijuana use was approved in Massachusetts, making it the 18th state (plus DC) to give the nod to medical marijuana use; however, Arkansas voters nixed their ballot initiative 51% to 48%. Even with state initiatives, marijuana is still illegal at the federal level. Plus, as with most things, the devil is in the details and most states are scrambling to figure things out. But the train has left the station and is definitely gathering steam so this is an issue that employers need to take seriously. In the Seattle Police guide linked above, we note that the police are looking at the employment-related implications of the law, as well as other matters. Q. Will police officers be able to smoke marijuana? A. As of right now, no. This is still a very complicated issue. Q. If I apply for a job at the Seattle Police Department, will past (or current) marijuana use be held against me? A. The current standard for applicants is that they have not used marijuana in the previous three years. In light of I-502, the department will consult with the City Attorney and the State Attorney General to see if and how that standard may be revised. Over at the LexisNexis Employment Law Community, attorney Donna Ballman reminds employees that Legal Marijuana Use Can Still Get You Fired. She cites case law on issues ranging from drug testing to the ADA. Most interestingly, she also discusses state laws that prohibit discrimination against medical marijuana users and prohibitions against termination/discrimination based upon an employee’s lawful activities off-duty. Nothing in this Section is intended to require an employer to permit or to accommodate the use, consumption, possession, transfer, display, transportation, sale or growing of marijuana in the workplace or to affect the ability of employers to have policies restricting the use of marijuana by employees. 1. Have a written policy covering substances such as drugs and alcohol. 3. Make sure that the policy prohibits any detectable amount of illegal drugs, as opposed to using an “under the influence” standard. 5. Be prepared to see marijuana come up in collective-bargaining and termination negotiations with unionized employees. We’ve also dusted off a few prior posts that we made on medical marijuana because they outline some issues employers will need to consider. It’s Cavalcade of Risk week, and you can see the latest roundup by Louise Norris in her Risky Business post at Colorado Health Insurance Insider. Louise always does a thoughtful write-up on submissions, and she has some stunning photos to boot. Check it out! The last time we encountered Clayton Osbon, he was strapped to a gurney after being forcibly removed from an airplane. Osbon was a Jet Blue pilot who had a psychotic break during a flight from New York to Las Vegas back in March. He randomly flipped switches in the cockpit, turned off the radio and told his co-pilot that “things just don’t matter.” When he left the cockpit to go to the bathroom, the co-pilot locked him out of the cabin, after which he ran up the aisles, shouting incoherently about religion and terrorists. The flight was diverted to Amarillo Texas, where Osbon was arrested and charged with interfering with a flight crew – his own, as he was crew leader. The psychotic episode lasted about a week. After a July trial, Osbon was sent to a prison medical facility in North Carolina for evaluation. He apparently suffered another psychotic episode in prison – a significant event, as it demonstrated that his illness was not a one-time incident caused by the combination of sleep deprivation and substance abuse. At a recent hearing in Amarillo, a forensic neuropsychiatirst testified that Osbon had experienced a “brief psychotic episode” brought on by lack of sleep. Osbon was found not guilty by reason of insanity. The medical records are sealed – as they should be – but the requirement that Osbon attend a treatment program for substance abuse makes it clear that drugs or alcohol were a factor in the incident. U.S. District Judge Mary Lou Robinson has prohibited Osbon from boarding an airplane without the court’s permission; he and a Jet Blue colleague had to drive the 1,300 miles from Georgia to Amarillo for the hearing. The court has also ordered him to seek alternative employment, as his prospects for flying an aircraft are likely gone forever. Given his age (49) and the court directive to find alternative employment, Osbon finds himself in the same position as injured workers in the comp system whose disabilities prevent them from returning to their original jobs. As a pilot, Osbon has a formidable set of transferable skills, which theoretically should make finding a new career relatively easy. It is likely, however, that his earnings capacity will be severely reduced. In addition, given the fragility of his current mental state, he may be months away from being able to function in a work environment. In the course of a few days in March, Osbon went from being a skilled and productive member of society to a confused, fragile individual incapable of functioning in the world as we know it. He is fortunate to be supported by his family – often the sine qua non of survival for people with mental illness. In rebuilding his life, Osbon faces the burden of demonstrating to others – and to himself – that he can once again be sane, reliable and stable. Osbon’s story embodies mystery – and agony – of mental illness. In his case, psychosis appears to have been triggered by a combination of sleep deprivation and substance abuse. But taking it one step further, perhaps the sleep deprivation and substance abuse were part of a desperate effort to mask and subdue a more primal turmoil in his mind. We only know the end result of that fierce inner struggle: a battle was lost, at least for the moment, and Osbon now faces a future where every gesture is scrutinized with fear and every day looms with uncertainty. Formidable challenges now confront Osbon and those who support him: the search for a return to the simple joys of everyday life, where he can be comfortable in knowing who he is and what he needs to do. We can only wish him well. Joe Paduda has posted a robust Elections Have Consequences issue of Health Wonk Review at Managed Care Matters. In this post-election issue, many of the blogosphere’s best health policy wonks opine about what this means for health reform, discuss some of the health policy issues that are likely to surface over the next four years – and even offer some thoughts about implications for workers’ comp. Plus, there’s an assorted grab bag of other issues – good reading to start your Monday off. While there, check out some of the other recent posts – there’s always thoughtful reading at Joe’s blog. If it isn’t on your must-read blog shortlist, it should be. Obama’s election & employment law, insurance, worker safety – Stephanie Thomas of The Proactive Employer posts about Obama’s Next Four Years: What It Means for HR and Employment Law. Daniel Schwartz of Connecticut Employment Law Blog weighs in with Four Potential Employment Law Impacts of Obama’s Next Four Years. Paul Secunda of Workplace Prof Blog posts about the 2012 Election and the fate of state labor law Initiatives, and John Hyman of Ohio Employer’s Law Blog says that it just doesn’t matter: “You should still follow the golden rule. You should still treat employees with dignity and respect. You should still pay employees for all the hours they work. You should still avoid discrimination, and harassment, and retaliation.” At Property Casualty 360, Arthur Postal weighs in on The Election’s Impact on Insurance Issues, and from the public policy and worker safety perspective, Celeste Monforton of The Pump Handle offers a worker safety wishlist for Obama’s second term. As someone who equates shopping malls with one of the lower circles of hell in Dante’s Inferno, I avoid them whenever possible. I find myself suffering along with the retail sales force: understaffed, overworked and underpaid. Steven Greenhouse writes in the New York Times that not only are these workers underpaid, they can be the victims of sophisticated software scheduling programs (Kronos or Dayforce, to name just two) that can easily make the ordinary demands of personal life spin out of control. There are about 18.6 million retail jobs, 70 percent of which used to be full time. In the relentless effort to reduce costs, 70 percent of retail jobs are now part time. Part-time workers often endure irregular schedules, with hours tied to customer flow. They may be called in for relatively short shifts – a couple of hours at peak times – and then sent home. If workers are unavailable to heed such calls, the work goes to someone else – and the hesitant worker falls further down the list of preferred staff. Here’s one example of “just-in-time” staffing: Jamba Juice tracks the weather forecast. When hot weather is on the horizon, extra workers are called in. When the heat spell breaks, fewer workers are scheduled. Being on call for a relatively low paying job might wreak havoc on one’s personal life, but it sure helps the company’s bottom line: by scheduling the workforce in 15 minute micro intervals, companies might save as much as 4 to 5 percent in labor costs per year. While retailers have the option of increasing the hours of their part-timers, they would rather add more bodies to the workforce. They can pay these folks less ($10.80 average for part time versus $17.18 for full time) and they can avoid the issue of benefits. About 30 percent of part-timers would prefer to work full time, but few are given the opportunity. Scheduling programs can quickly scan available workers and pull in the ones with the lowest hourly rates. Isn’t that cool?! You could easily ensure that only one relatively senior worker is present at any given shift. It may seem harsh to refer to this marginally employed workforce as sharecroppers, but the image comes from an industry consultant, who notes that companies benefit from using many part-timers as opposed to fewer full-timers. It’s almost like sharecropping — if you have a lot of farmers with small plots of land, they work very hard to produce in that limited amount of land. Many part-time workers feel a real competition to work hard during their limited hours because they want to impress managers to give them more hours. Of course, they rarely get those new hours, because their employers prefer to limit any given worker’s time on the job – rather like the greyhounds who chase the mechanical rabbit around the racetrack. During my increasingly infrequent mall visits, I find myself brooding on the difficult lives of these exploited workers. I have become infinitely more patient with them, no longer blaming them for not knowing the stock or being unable to answer a simple question. They are simply tilling the barren soil of their last-ditch employment, hoping that a better job, a career even, might be part of their murky future..